Are you one of those who can’t sleep before making some calculations, writing your diary, or even leaving a note about something important for the next day? The master bedrooms with built-in desk are the best siltation for you. And here we will offer some simple ideas to help you choose the design which will fit in your bedroom. If you are one of the past types of people or if you are from the other type that loves to take your work home! 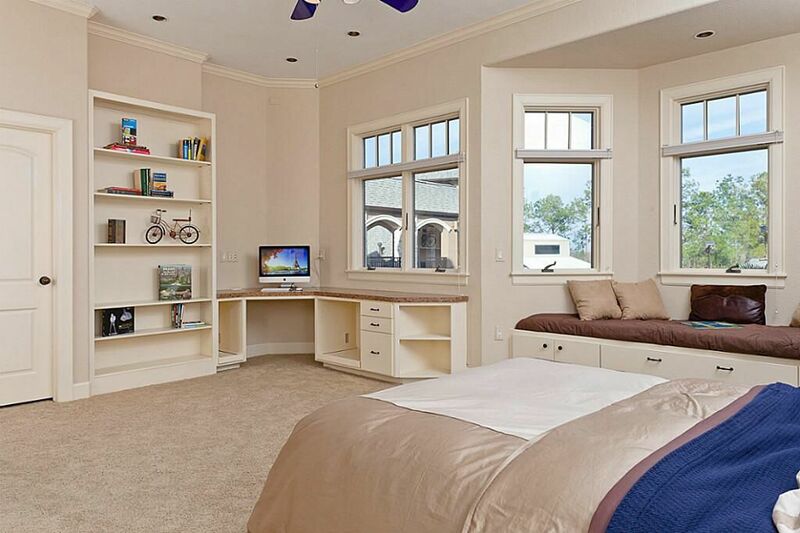 Having one of the master bedrooms with a built-in desk will make your life easier. You can work in a cozy atmosphere without the need to get outside of your master bedroom to send an important e-mail to finish the job at the right time without any delay. Master bedrooms with built-in desk ideas could be very simple and very brilliant at the same time if you want. The built-in desk could be in the center of your wall library or in a corner of your master bedroom it is up to your choice. There is a variety of choices which could fit perfectly in your master bedroom. You can use an empty corner to install a built-in desk it will be a smart idea to save some space and to accomplish some late works. If you do not have enough lighting you will be in need of an extra source of lighting which will provide the light that you will use while working on your built-in desk. if you have one of those master bedrooms with built-in shelving you can easily use the first shelf as your new built-in desk and then start the process to make it comfortable by choosing a nice and cozy chair and place it in the front of the desk to be the place that gives you the push to finish your work in a comfortable way. Usually, space between the columns in the master bedroom is not used well. But if you decided to use it to placed one of the built-in desks in the narrow space between the two columns in your master bedroom you will be doing as they say (You will hit two birds with one stone). You will be saving the space and making a good use of this narrow space which is usually unused. If the space between the bed and the wall was enough to install one of those smart built-in desks you will be lucky! You can use the lighting on your new built-in desk while sitting for work on the disk and also, to read before you go to sleep on the bed. The wall lighting which you can control its directions is the best in this case. You can move the light direction from side to side to fit your needs. You can control the style of your new built-in desk with the chair that you will use on the front of it. So, it is that simple, you can use a simple stool if the style of the master bedroom is simple as the modern style. But if the style of the bedroom was classic using an armchair with a distinctive upholstery fabric will be a nice choice for this style. The leather chair is the best choice for manly style. You can paint the built-in desk with the color you love which could be the same color of your master bedroom, or you can use white color as it could make a nice contrast in your master bedroom if its colors were in dark tones. The black color is also a good choice for those who admire this color and the elegant appearance that could be provided by it. Your new built-in desk could be with drawers for storage which will be a solution for the problems of saving the important documents and papers. But if your new built-in desk was only a simple shelf without any place to use as storage you will be in need to add some small side shelves on the wall above your built-in desk so, you can use them opened or you can put some boxes on it to save your documents and your stationary inside them. You can also add a small unit of drawers under the built-in desk to keep everything organized. these are the simplest ideas, and tips for the master bedrooms with built-in desk which we hope it will give you some inspiration to have one in your house.